For successful overnight hikes, you've got your shelter and sleep system packed and ready to go. Now you just need to find a nice place to set up and get some rest. As long as you aren't too picky and make some ethical choices, you should have no problem finding a campsite. There are many options depending on what you want available when you stop for the night. When considering a hiking trip, part of your planning should be an honest assessment of what camping means to you. Each hiker has different expectations when it comes time for rest. Some people demand a shower, bed, and breakfast while others just don't want to freeze to death overnight. The more amenities you require, the fewer options for overnight camping you have and the more you limit your hiking routes. Highly Developed - I need showers, toilets, firepits, firewood for sale, possibly a store, laundry, and family activities. Developed - I need water, a toilet, and a flat place to sleep. Open - I need nothing. I'll bring my own water, dig a cathole toilet, and find some spot for my shelter on my own. Hotel - hiking all day and sleeping in a hotel at night can be great fun. This includes bed & breakfasts, youth hostels, summer camps, and any place else that will rent a bed for the night. Some state forests have cabins, yurts, and old lookout towers which can be rented. This is the most expensive and comfortable camping option. 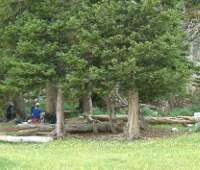 Private Campground - Private campgrounds are in business to make money so fees are often relatively high but services are more complete since these are normally highly developed areas. There may be water parks, play grounds, mini-golf, and all sorts of activities for families. Campsites are close together and privacy is fairly non-existent. There will be RVs, small children, college parties, and dogs. National, State, County, City Parks - Many parks do not allow camping, but the level of development varies widely in those that do. They usually at least have vault toilets and pump water but some are more highly developed than private campgrounds. These have a fee, but campsites tend to be a bit better and prices a bit lower than private campgrounds, but don't expect any more privacy or quiet. National or State Forests - Offer established campgrounds, less developed than parks, but just fine for hikers. Almost all have open camping available also. It's also called undesignated, dispersed, or free range camping. 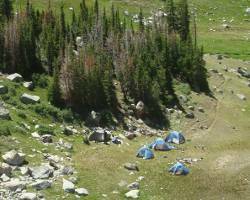 They allow hikers to camp anywhere as long as they follow guidelines. You will find no water, toilets, or amenities of any kind. You are completely on your own to bring or find water. The guidelines differ by location, so do your research and find out about the area in which you will hike. Some allow fires, some do not. 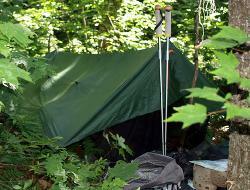 Some have restrictions about distances from trails and developed campgrounds. There may be restrictions on animals and group sizes. No matter where you camp, practice Leave No Trace principles. Public Lands - National Grasslands, Wildlife Management Areas, designated Wilderness Areas, and Bureau of Land Management (BLM) lands are also possible open camping locations. BLM lands are wide open free camping in the great west, often in the desserted desert areas where most folks don't want to camp anyway. Wildlife and Wilderness areas all have individual regulations, so pre-trip planning is important. Private Land - Some hiking routes, such as thru-hiking trails, take you through populated areas with no campgrounds, forests, or public lands. 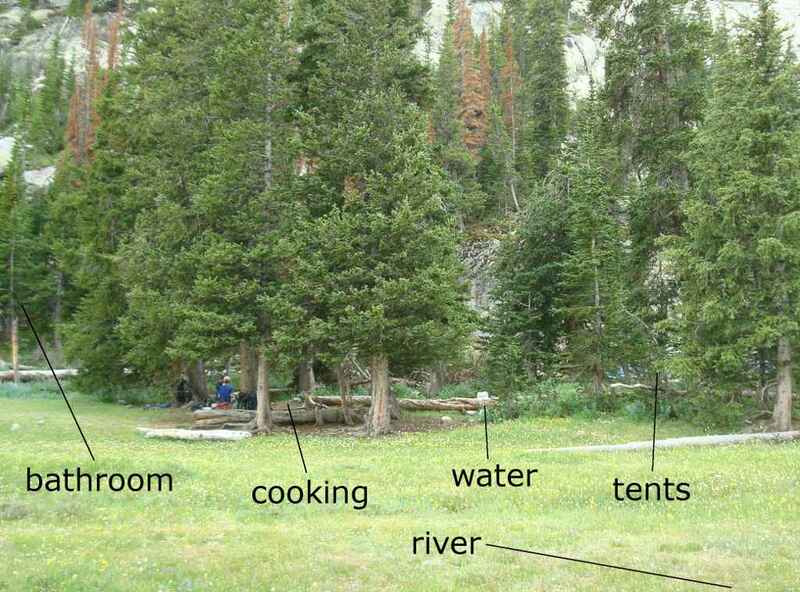 In this case, camping options are few and sketchy. The best thing to do is research before your hike and find out land owner names along your hiking path. Contact them beforehand, explain that you are hiking through, and ask if you can pitch your tent in the corner of their property one night. If you have no luck figuring it out ahead of time, then seeking out land owners as you hike by and asking for permission is your next best option. In rural areas, this usually works just fine but finding a person can be challenging. Stopping by a gas station, bar, or other public spot in town and being friendly can often result in an offer of a spot to crash. Finally, in an emergency or (more likely) due to poor planning, some multi-day hikers resort to stealth camping which is unethical at best and dangerous at worst. This is also known as ninja camping or guerilla camping, but is basically camping someplace you know you should not so you do it on the sly, doing your best to remain undetected. If you are detected, you may be asked to leave, told to leave, threatened, fined, or roughed up, depending on who finds you and your location. Click Image In established campgrounds, campsites are designated and it's awful easy to figure out where you'll sleep, eat, and go to the bathroom. When you're in the wilds and looking for an open camping spot, there are many tips to keep in mind for comfort and safety. Camp away from food sources, such as berry patches and fruit trees unless you want to fight off animals coming for dinner. Camp away from water sources, streams, ponds or you will disrupt and stress the critters that need to drink to survive. About 100 steps is a minimum, but it's better to camp 1/4 mile or more away and just visit to get your water and leave. Camp away from animal (and human) trails. About 100 steps off the trail is a good limit - further is better for privacy and to give animals safe passage. Camp inside the edge of forest rather than out in a meadow where animals and people see you and lightning and wind finds you. Camp on a slight rise so water flows away from you rather than pooling in a low spot that seemed very flat. Southeast sides of hills are usually more protected from weather and get the sun earlier. Really, practice Leave No Trace principles and use impacted campsites you find, avoid slightly used areas, and be extra careful in pristine areas, finding durable surfaces for camp. Check for dead limbs and trees above you. Check for signs around impacted areas - the land agency may have it restricted due to the high use. I disagree with you about stealth camping. Stealth camping, though it has some drawbacks (it requires relatively high levels of skill to do correctly and can be dangerous if done wrong), is a completely acceptable way to camp. If one is doing it properly (i.e: actually stealthily) then I would consider it the MOST ethical choice for spending the night, anywhere, bar none. Truly stealth camping means that nobody notices you before, during, or after your stay. You don't bother anyone, and you leave zero impact on the area (it's leave no trace to the extreme). If done legally, you're camping on open land, so you are NOT trespassing. Stealth camping (illegally) while trespassing infringes on someone else's property rights, and therefore WOULD be unethical. @Nelson - Stealth camping, Ninja camping, Wild camping, Guerrilla camping, Gypsy camping, Open camping, or Free camping whatever it's called - can have negative or positive interpretations, depending on how it is done. By your definition, it is the proper way to camp anyplace. Nearly everyone I've talked to about 'stealth' camping interprets it as trying to get away with something - being unnoticed because the camper should not be there. 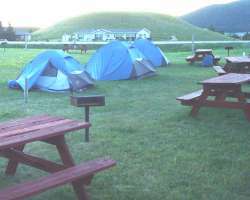 Dispersed camping is the term more formally used to describe minimal impact camping in undeveloped areas. I agree with Nelson. "Stealth" camping, done correctly, is low impact, and an ethical way to camp. It is a way for the person who truly wants to experience nature, rather than an overused campsite, to get into the wild. Of course, there is the semantics involved. 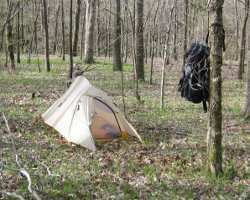 Stealth camping to many might indicate that some crazy survivalist is out there trying to get away with something illegal. So, I do prefer the term, "dispersed camping".